:: Sponsored by: League of NH Craftsmen, Bromfield Gallery, Vermont College of Fine Arts, Solomon's Collection and Fine Rugs, Rockport Art Association and Museum, Art League Rhode Island and the Artscope Tablet Edition. 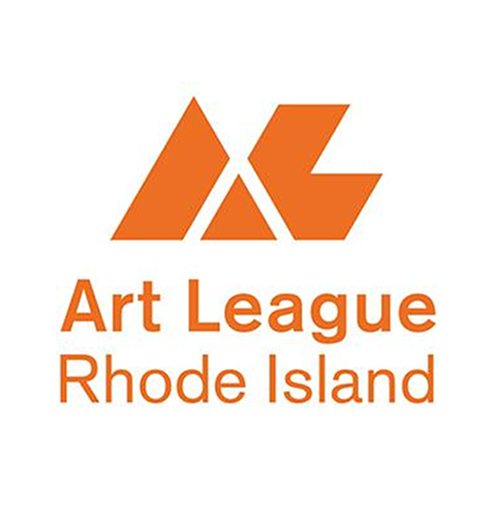 This week we're presenting The Art Complex Museum, Lamont Gallery, and North Shore Art Association with exhibitions that reveal the results of effective collaborations and organizations of artistic talent. There are also other interesting and exciting events happening soon for those who want more. Join us for Attleboro Arts Museum's opening for "8 Visions" on August 1. There will be an artist talk from 6:30 p.m.⎻8:00 p.m. and an opening reception from 8:00 p.m.⎻9:00 p.m. The pieces featured in this exhibition are juried in part by Artscope founder and publisher, Kaveh Mojtabai and are featured in Artscope's current July/August issue. We hope to see you there! The exhibition will be on view until August 31. Join Artscope at Bowdoin College Museum of Art on August 2 for a Gallery Conversation on Richard Pousette⎻Dart from 7:00 p.m.⎻8:00 p.m. Co-director Anne Collins Goodyear and Curator Joachim Homann will participate in a conversation with Artscope's Kaveh Motjabai. The talk will discuss how art and science intersect, and how each one influences the other. The talk is free and open to the public, so be sure to come by! 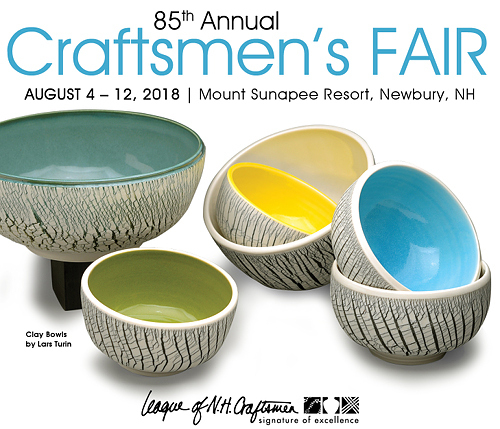 Artscope is sponsoring League of NH Craftsmen's 85th Annual Craftsmen's Fair, happening August 4⎻12 from 10:00 a.m.⎻5:00 p.m. daily at Mount Sunapee Resort. Visitors can view and shop the work of over 300 craftsmen. Tickets are currently on sale; get yours now! We're also sponsoring South Coast Artists' 15th Annual Open Studio Tour 2018, happening August 18⎻19. It includes over 70 artists across Tiverton, Little Compton, Westport and Dartmouth. The tour is free to attend, so give it a look! Artscope is sponsoring Worcester Art Museum's exhibition Exploring the Myths of James Dye. The exhibition features the ink drawings of James Dye, showcasing his interest in mythology. The exhibition was featured in the May/June issue of Artscope and will be on view until September 2, so be sure to check it out! We're sponsoring Fruitland Museum's current exhibition "Leisure Pursuits," which displays antique dresses and accessories from the past 125 years of Massachusetts history. The exhibition will be on view until March 24, 2019, so there's plenty of time to see it! 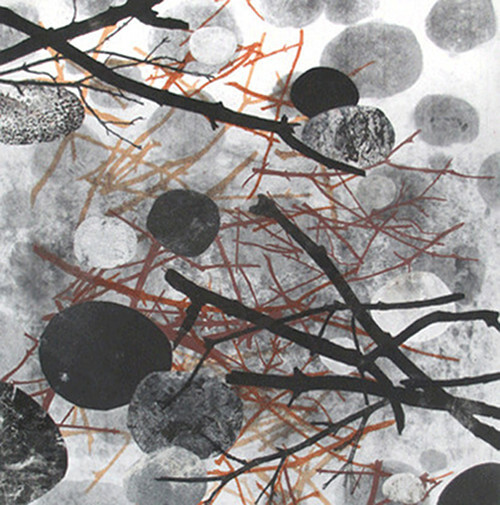 Joan Hausrath, Pawtucket, Rhode Island, Sticks and Stones B9, 2016, Monoprint. The Monotype Guild of New England's "Fifth National Monotype/Monoprint Juried Exhibition" is on view from now until September 2 at The Art Complex Museum. The Monotype Guild of New England (MGNE) is a national, nonprofit organization comprised of over 250 artists and dedicated to the appreciation of monotypes and monoprints. 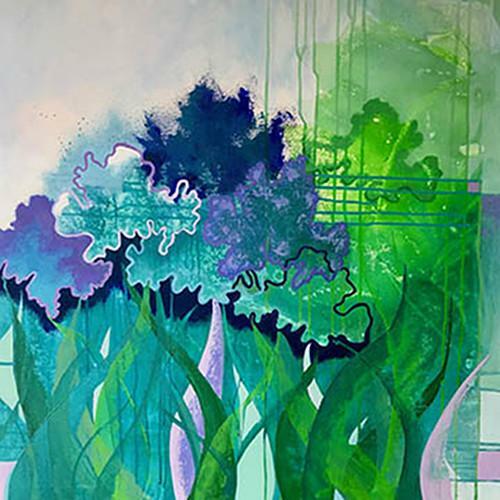 MGNE sponsors exhibitions, workshops, and special programs across the United States, including the "Fifth National Monotype/Monoprint Juried Exhibition." 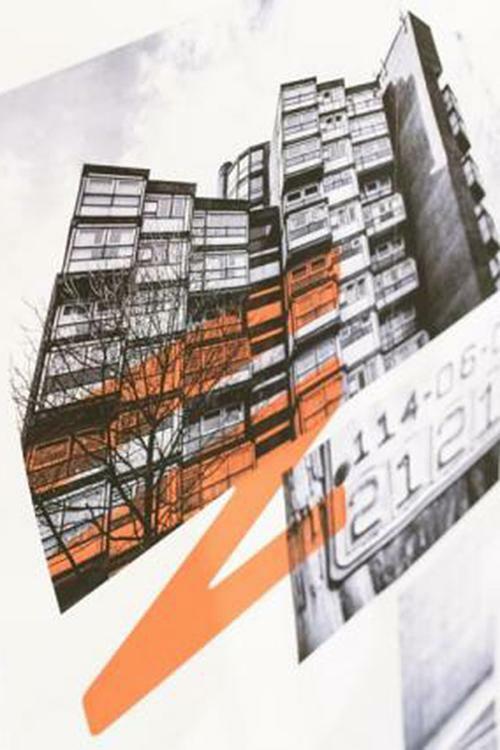 The exhibition includes over seventy⎻five works by printmakers and artists from all over the country, showcasing the diversity and innovation found in the printmaking medium. The "Fifth National Monotype/Monoprint Juried Exhibition" is being juried by Judith K. Brodsky, a board chair of New York Foundation for the Arts. She's also a printmaker and artist whose work has been featured in many permanent institutions both in the United States and abroad. The "Fifth National Monotype/Monoprint Juried Exhibition" is a tour de force showcasing the best monotypes and monoprints MGNE has to offer. The Art Complex Museum is located at 189 Alden Street in Duxbury, Massachusetts and is open Wednesday⎻Sunday 1:00 p.m.⎻4:00 p.m. For more information, please visit artcomplex.org/exhibitions.html. Sponsored by: League of NH Craftsmen, Bromfield Gallery, Vermont College of Fine Arts, Solomon's Collection and Fine Rugs, Rockport Art Association and Museum, Art League Rhode Island and the Artscope Tablet Edition. August 4⎻12, Mount Sunapee Resort in Newbury, NH. Enjoy 9 days of shopping for one-of-a-kind craft. Meet talented master craftsmen, see demonstrations and exhibitions, DIY workshops, live music, NH Beer and Wine Garden, and more! Discount available on full price tickets using code ARTS18. Details and tickets at nhcrafts.org/fair. Anika Savage, In Love, acrylic on canvas, 36" x 36", 2018. From August 1⎻19, Bromfield Gallery presents "Summer Invitational," 16 New England artists invited by the gallery to show new work. The opening reception is Friday, August 3, from 6:00 p.m.⎻8:30 p.m. The MFA in Graphic Design's Fall 2018 application deadline is approaching! GD USA ranked VCFA among the top MFAs in the US for our conceptual depth and collaborative community. Admissions Deadline: August 20. Apply now at vcfa.edu/graphic-design or contact Brittany Powell at brittany.powell@vcfa.edu to set up a call. 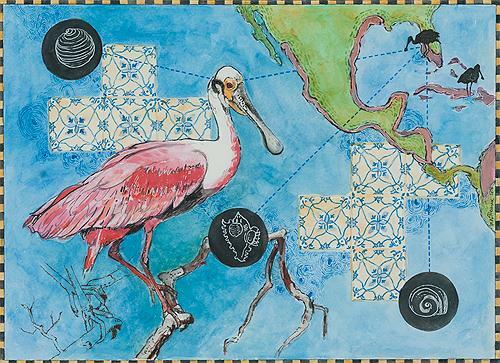 Phillips Exeter Academy's Lamont Gallery is featuring "Welcome to Bird Land: Michele L'Heureux" until October 13. L'Heureux is an artist and curator who is currently Director and Curator of the Montserrat College of Art galleries. For "Welcome to Bird Land," she's worked with artist and collaborator Helen Popinchalk to create, as described within the exhibition webpage, an "immersive ode to birds." The exhibition draws inspiration from the appearance, behavior, environment and human appreciation of birds. It also explores how an encounter with a single bird—the "spark bird" as described within the exhibition webpage—can inspire a lifetime of admiration for birds. The exhibition also features an interactive bird blind and multiple works of art from the Lamont Gallery collection. One doesn't have to be a bird-lover to enjoy this exhibit, though. "Welcome to Bird Land" reveals the similarities between birds and humans and showcases the importance of birds to both humans and our world. Lamont Gallery is located at 20 Main Street in Exeter, New Hampshire and is open Tuesday⎻Friday 9:00 a.m.⎻4:00 p.m. until August 24, after which it will be open Tuesday⎻Friday 9:00 a.m.⎻5:00 p.m. and Saturday 10:00 a.m.⎻4:00 p.m. For more information, please visit exeter.edu/lamont-gallery/current-exhibition-welcome-bird-land. North Shore Art Association has two exhibitions on view as it transitions into August. "Artist Members Exhibition III" is showing from now until August 18. This exhibition contains various juried works from North Shore Art Association's artist members, including Jeff Weaver, Mark Shasha, Rachel Wilcox, T.M. Nicholas, Susan Ellis, Phyllis Feld, Judy Metcalfe, Hilary Baldwin, Timothy Neill, Ellen Whitman, Rosalie Sidoti, and Associate Member Robert Levasseur. On July 27, "Works on Paper", a solo show by Jeff Weaver will open. Weaver works from his studio/gallery in Gloucester. He has been capturing the beauty of Gloucester since the 1970s. The solo show will feature drawings, pastels and watercolors. Both "Artist Members Exhibition III" and "Works on Paper" showcase the artistic beauty and scenery of New England. North Shore Art Association is located at 11 Pirates Lane in Gloucester, Massachusetts and is open Monday⎻Saturday 10:00 a.m.⎻5:00 p.m. and Sunday 12:00 p.m.⎻5:00 p.m. 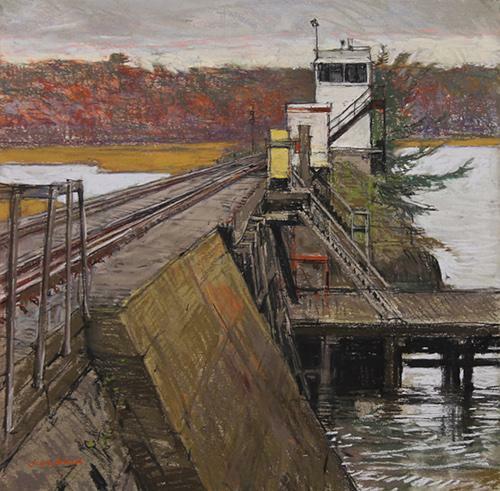 The North Shore Art Association season runs through October 20th. For more information, please visit https://nsarts.org/exhibitions.html. Outdoor Painting with Keith Gantos: July 31, 2018 from 9:00 a.m.⎻3:00 p.m. 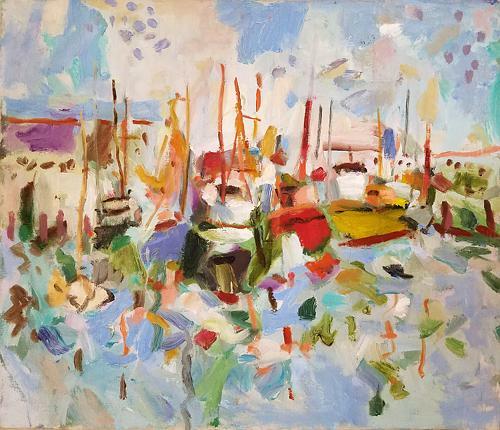 Outdoor Painting with Carole Loiacano: August 2, 2018 from 9:00 a.m.⎻3:00 p.m.
Oil Painting Demonstration with Rosalie Sidoti: August 2, 2018 from 6:30 p.m.⎻7:30 p.m.
Oil Painting Demonstration with John Caggiano: August 9, 2018 from 6:30 p.m.⎻7:30 p.m.
Weekly Sketch Group: August 3, 2018 from 1:00 p.m.⎻4:00 p.m. Images have power to convey ideas across languages and cultures. Today, our visual fields are filled with imagery, and a literate mind unconsciously reads text without considering it. From road signs and graffiti, to pop-up ads and text messages, we are constantly ingesting language and its message. How does the involuntary practice of reading and translating influence the artistic practice? Can text itself stand as an image, or will our minds always connect to a literal meaning? Must a word always carry meaning, or can words and letters act as graphic elements? Parsing Sign and Image seeks submissions that consider the influence of letters, text, signs and language. Notification of Acceptance: On or before August 10, 2018 via email. No inquires please. All decisions are final.